Golden Mountain Off Road Park. We celebrated Labor Day and Princess’s birthday by going off roading at Golden Mountain Off Road Park. I spent the early part of the weekend installing Princess’s SYE equipped 231 Transfer case and getting the pinion angle right in the rear. But by Monday, we were ready to hit the trails. Our previous visits to Golden Mountain had been last fall when the trails were wet and slippery. This trip they were dry and dusty. At the park entrance we were greeted by the very friendly park owners. They made us feel very welcome. 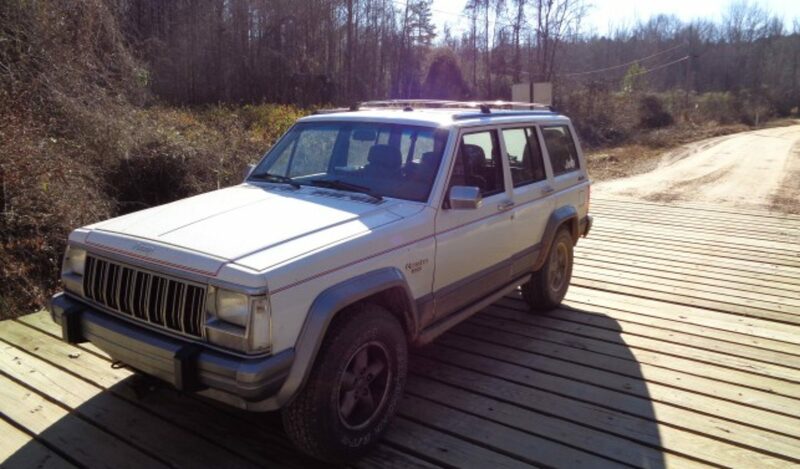 After unloading my truck from the trailer and removing the doors from both Cherokees, we headed up trail one. Trail one has always been our nemesis in the wet. It is marked easy on the map but even in dry conditions it is challenging. On our previous attempts is has proven impassable. This time we made it all the way to the top. Coming back down the other side of trail one proved to be even more of a challenge however. This part of the trail has eroded into a deep V notch right down the center of the trail. The only real way down is to straddle the V. I made it fine but Jenny got hung up in one of the transitions. I had to help her get untangled. Once down from there, we headed up trail 11. This is a fun rocky climb. There was a spot where Jenny got hung last time, but this time equipped with lockers, a SYE and no doors, she made it easily. At the top of 11 we made our way to 12 and made the loop. Trail 12 has several rocky sections and then ends in a long hill climb. Jenny got hung in a muddy spot last trip, but there was no mud to hang in this time. Just lots of dust. The dust made some of the climbs slippery, but not like the mud. We took trail 29 down to intersect with trail two and took a break. This was our first time on 29 with was pretty easy in the dry but would be very slippery if wet. After a rest break we headed up trail two to Jenny’s favorite ledges. Again they were much easier in the dry. At the top, we toured the pavilion and the camping areas. Here I noticed my Jeep was running very hot. I soon discovered that the electric fan was not working. We made the short trip down the paved road to the trailer and I scavenged wire from Jenny’s Jeep to make a jumper for the fan. I simply wired it directly to the battery so that meant every time I stopped for any length of time, I had to open the hood and disconnect the wire. We headed back up the trail and made the 12, 29, 2 loop again. This time we decided to try an unmapped spur off trail 11. This brought us out at one of the pavilions across from the lake. My Jeep was still running hot so I let it cool and added some water. Scott called and we arranged to meet him at the gate. After picking him up, we ran back up trial one again. This time we took trail 10 on our way to see the top of bounty hill. Trail 10 we found has a very scary section where you have to make two very steep drops in about the length of the Jeep. Scott spotted me down and then did the same for Jenny. I was really glad we did not have to go back up that section. The climb back out of the hole was still pretty challenging as it is a steep rutted climb. The climb ends with a choice of two big boulders that you have to climb the face of. I did not want to loose momentum, so I made a quick decision of the one on the left. That turned out to be a good choice and I made it up easily. I got out and was able to spot Jenny to the smaller boulder as well. My Jeep was running much better with the fan on and the radiator full of water. I was really glad that I was able to make a simple fix. We took time to climb on the boulders overlooking bounty hill. I have watched videos of buggies going up it but I would really like to see one in person. Next we went down trail 27 to one and made our way to 21. This required running the same part of one that gave us trouble earlier in the day. Jenny got hung up in the same spot again. With Scott spotting me I drove her Jeep up onto the bank and out over the V notch. At one point Scott said the front tire was about two feet in the air but it did not feel tippy until it had already started back down. We drove up 21 and took a look at Hellivator and some of the other climbs in the same area. We all agreed that we look forward to watching someone do these climbs. We turned around and headed back down trail 21. We took 11 for the third time just because it is fun and took the exit by the small pavilion. We stopped again to tour the big pavilion and take advantage of the facilities there. Caleb enjoyed the playground for a while too. We headed back into the trail 12 loop and then took 29 back down and then exited on the lower part of trail 2. By the time we made it back to the trailer, we were all very tired and dusty, but we really enjoyed our day at Golden Mountain. Great write up on Golden Mountain. Very nice place to go to!